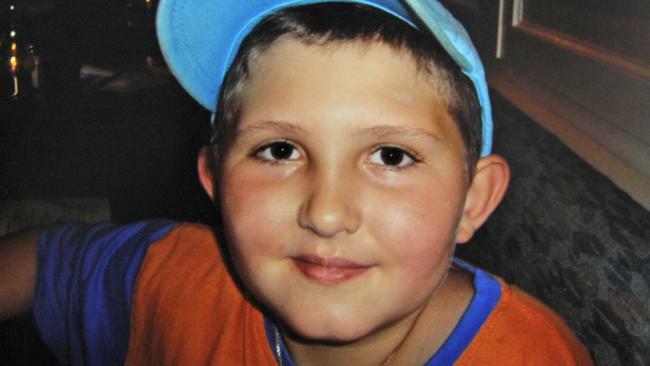 Thursday, May 08, 2015, multimillionaire Manhattan socialite, Gigi Jordan, was sentenced to 18 years in prison for the manslaughter of her eight-year old autistic son, Jude Michael Mirra. Jordan never denied that she had intended to kill her child by way of forced pill overdose five years previous in a New York City hotel. To her troubled mind, the forced pill overdose was a “mercy killing”, preserving the child from the inevitable horrors he was to suffer at the hands of an unseen, yet omnipresent, Satanic cult conspiracy. Warning signs of Jordan’s dangerous state-of-mind had been clear for years. Jordan expressed deeply paranoid, irrational fears that the cult was actively tracking her every activity while ritually abusing Jude into a state of trauma-induced cognitive disability (he was, in fact, severely autistic). Many questioned what, if anything, was true in Jordan’s suspicious, delusional allegations. However, few questioned the competence of the therapists and other experts whom Jordan had consulted, who failed to recognize Jordan’s dangerously delusional state, failed to balance her fantastical beliefs with critical inquiries, and even apparently encouraged and cultivated her most deranged and deadly convictions. Oddly, even when reporting on the trial, journalists seemed entirely blind to evidence of professional incompetence, the influence that sanctioned pseudoscience seems to have played in Ms. Jordan’s destructive beliefs. Ms. Jordan contacted the Wyoming Division of Criminal Investigation in 2008 with a bizarre, sprawling and disjointed tale of Ritual Abuse and constant, unshakeable surveillance. She was detained, on an emergency basis, for a mental health evaluation. Jude was taken into custody. Before arriving in Wyoming, specifically for the purpose of reporting the Satanic cult crimes to the investigators, Jordan travelled with Jude to various locations across the nation, staying in hotels, relocating at a moment’s notice in an attempt to throw Jude’s pursuers from their trail. Having contacted the Wyoming office in advance, Ms. Jordan was met by Law Enforcement at the airport. Jude, the agents noted, was without socks or underwear on his person, nor did Jordan’s luggage contain any fresh clothes for the boy. The agents were further alarmed by the copious amounts of unlabeled medications Jordan carried for Jude’s seemingly ad hoc “treatment” regimen. Physical examination would yield “no evidence of sexual assault of any kind”. More discrediting to Jordan’s claims, however, was the fact that Jude, the alleged source of the abuse allegations, appeared to have very little verbal skills with which to communicate the allegations at all. Against medical advice, Ms. Jordan was released “of her own recognizance” after her emergency mental health evaluation, following which the Court considered evidence indicating that Jordan presented an imminent danger to her son. Clearly not at all convinced of Ms. Jordan’s sanity, or Jude’s safety in her care, the Court also didn’t feel that the legal burden of evidence was met to justify placing Jude in foster care. Just under two years later, on February 03, 2010, Ms. Jordan checked into the Peninsula Hotel in Manhattan with Jude, after hours of aimless cab rides throughout New York City. Late at night, while the boy slept, Jordan crushed about 20 Xanax pills and 40 Ambiens into a mixture of vodka and orange juice that she then forced down the 8-year old’s throat while sitting atop him “using enough force to bruise that boy on the face, the nose, the chest,” according to the prosecution. Media reporting on the case almost universally focused on the superficial narrative: the shocking tragedy of a millionaire mother, desperate and delusional, driven to the most unthinkable act of crime. Ms. Jordan had, some 20 years previous, started a successful home health care service upon which her affluence was built. The recriminations against “somebody in authority”, fearfully predicted by the Wyoming District Court, never manifested. Troublingly, nobody asked, following the murder, why Jordan’s dangerous mental state, so obvious to Law Enforcement untrained in Psychology, could have seemingly escaped the notice of the mental health care professionals whose services Ms. Jordan had retained. Jude was 7 years old when Florida-based “trauma therapist” Carol Crow diagnosed him with Multiple Personality Disorder (more recently known as Dissociative Identity Disorder [DID]). It’s a diagnosis that is problematic even in ideal therapeutic settings, as the condition enjoys no scientific validation and is largely viewed as discredited. In Jude’s case, however, such a diagnosis is further complicated in that it was arrived at by analysis of the boy’s own self-reports — reports he was clearly unable to convey in reality, but that were manufactured in his name via “facilitated communication”. The theory behind Multiple Personality Disorder (MPD), now rebranded as Dissociative Identity Disorder (DID), is that some traumas, particularly childhood sexual traumas, are so horrific and incomprehensible that memories of their occurrence are “repressed”, relegated to some dark corner of the mind, outside of immediate consciousness where they develop new, alternate, or “alter” personalities of their own. Intuitive as this might now sound in a culture wherein this premise has served as a well-worn dramatic plot device, none of it stands up to scientific scrutiny. While proponents of DID theory currently like to claim that the condition lies somewhere on a Post-Traumatic Stress Disorder (PTSD) spectrum, Dr. Richard McNally, Professor and Director of Clinical Training at Harvard University’s Department of Psychology, points out, “[t]he hallmark of PTSD is involuntary, intrusive recollection of traumatic experiences,”  not selective, protective amnesia. And while evidence for the existence of “repressed” traumas — often alleged to stem from long-term episodic extreme childhood abuse — is dubious at best, there is still no reliable evidence that DID even results from childhood trauma. The “evidence” cited to support the claims of DID’s relationship to child abuse comes primarily from self reports of the DID-diagnosed. 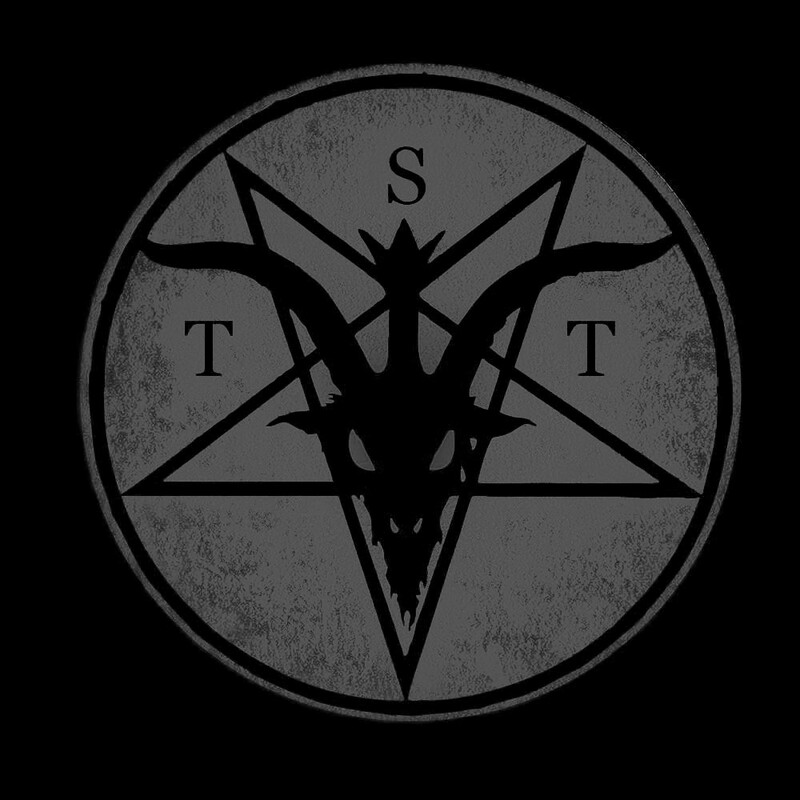 It was, in large part, the recovered memory testimonials of individuals being treated for Multiple Personality Disorder that sustained an embarrassing modern witch hunt known to sociologists today as the “Satanic Panic”. 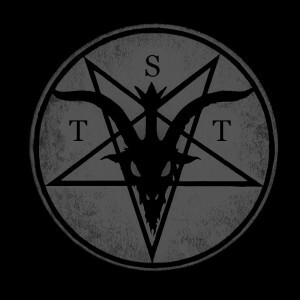 Spanning a period beginning in 1980 and declining into obscurity after the mid-90s, this bizarre moral uproar saw a temporary mainstreaming of hysterical conspiracist claims related to Satanic Ritual Abuse and cultic criminal networks secretly working toward the destruction of all societal moral order. Daytime talk show hosts, from Oprah Winfrey to Geraldo Rivera, regularly, and entirely uncritically, aired Satanic abuse “survivor” stories, despite a complete absence of corroborating evidence. It was a literal witch-hunt. Lives were ruined, families torn apart, decades of innocent lives wasted away in prison cells, and much of this, beyond any sensible doubt, was urged forward by incompetent therapists hypnotically probing their clients for revelations of repressed abuse. 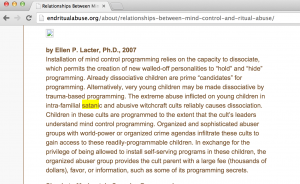 Despite being thoroughly and completely discredited by law enforcement, scientists, and journalists, the conspiracy theory of Satanic Ritual Abuse as an intentional, DID-creating trauma-based mind-control program, still holds currency among certain professionals in mental health care, and many of the mental health professionals who were instrumental in fomenting panic in the 80s still hold strong to their methods and theories today. 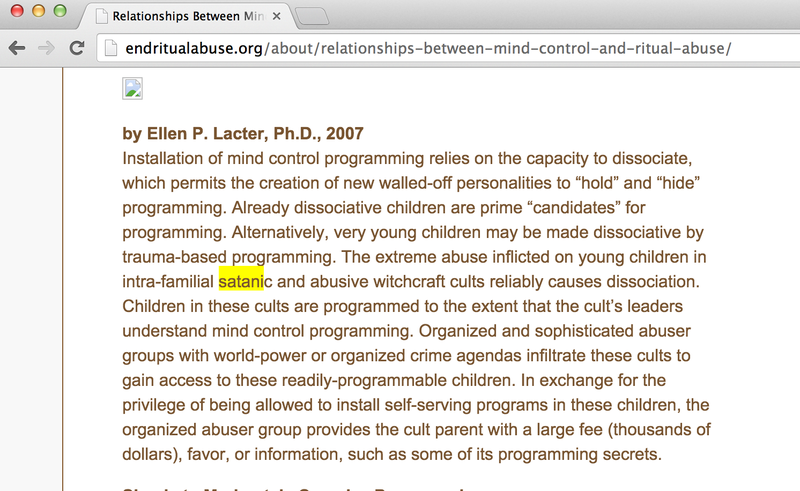 The first of three contacts listed for the ISSTD’s “RA/MC SIG” is one Ellen Lacter, a San Diego-based Clinical Psychologist with bizarre beliefs in Satanic conspiracies and government mind-control. It was to Ellen Lacter that Gigi Jordan took Jude in search of validation for her delusional and paranoid fears. Unsurprisingly, it appears she found it. Ms. Lacter, however, seemed to see none of Ms. Jordan’s apparently obvious delusional paranoia, even as Ms. Jordan spoke of an omnipresent Satanic cult conspiracy. How is this possible? But what exactly is Putnam talking about? What does he mean when he refers to “this kind of texting”? Is he referring to “facilitated” texting and, if so, why does he claim Jude could text independently? And why is it that Putnam failed to mention the element of Facilitated Communication at all? Does he deny that FC was being used at all, or is he claiming that there were occasional instances of independent texting? With no physical medical evidence to support the claims of Jude’s sadistic sufferings, Putnam attempted to match the self-reports allegedly typed by Jude to possible psychological symptoms of traumatic abuse. This necessitated that Putnam both reject Jude’s diagnosis of autism — attributing his cognitive difficulties instead to psychological trauma — and accepting the alleged self-reports attributed to Jude as legitimate communications from the boy. In rejecting the autism diagnosis, Putnam pointed to atypical features in Jude’s autism symptoms concluding, “it is highly probable that some of Jude’s unexplained and unusual medical problems were unrecognized injuries from physical and sexual abuse.” However, as another doctor noted, in recognition of Jude’s positive response to steroid treatments, “most cases of autism are not immune-mediated. There are however, rare cases of autism, variants of autism that are immune-mediated.”  Jude, it seemed, was one of those cases, nor could any idiosyncrasies in Jude’s symptoms change the unlikelihood that he’d suffered the tortures claimed, for which he remained physically un-scarred. Another regular ISSTD annual conference presenter, Bessel van der Kolk, submitted expert testimony intended to describe how trauma could manifest itself in ways that could look like autism. The court excluded his testimony, but there is a certain audacity to a man like van der Kolk submitting expert testimony at all. Back in 1996, while being deposed as an expert, defending recovered memory veracity and legitimacy, van der Kolk’s testimony was excluded after attorney Christopher Barden revealed severe problems in a research paper van der Kolk used to support his position. A graduate student, who had collected van der Kolk’s data, had been expelled for scientific dishonesty in falsifying data. Merely removing the student’s name from the list of co-authors, van der Kolk’s paper remained otherwise unrevised. It is exasperatingly disappointing that in all this time nothing has changed. Harmful and discredited theories are being put forward by the same unwavering individuals, to the detriment of mental health care consumers, to the detriment of the mental health care profession, and with occasional tragic consequences. Indeed, given the consensus among scientists, it would appear that only a “shocking ignorance” of advances in memory research and cognitive science could account for the dogged persistence of discredited DID therapies and repressed memory retrieval techniques. It is an outrage that a pseudoscience-based organization such as the ISSTD (much less an organization like S.M.A.R.T.) can offer Continuing Education Units while propagating conspiracy theory. Fully debunked by empirical studies, the use of Facilitated Communication by a licensed therapist to arrive at a psychiatric diagnosis should, at the very least, cause for revocation of professional licensure. Obvious public displays of paranoid delusion, such as those expressed by Ellen Lacter, should, at the very least, cause for revocation of professional licensure and mandatory psychiatric evaluation. The fact that Ms. Jordan, harboring paranoid delusions, could have her delusions supported and affirmed by licensed mental health professional is a monstrous mental health scandal. The facts are these: an 8-year old autistic boy was diagnosed with a debunked psychiatric disorder. The diagnosis was arrived at by discredited methods. The professional pseudoscientific assumptions surrounding the boy’s “treatment” likely contributed to paranoid delusions in his openly disturbed mother, who ultimately killed the boy in order to spare him from the horrors of a nonexistent threat. While the boy’s mother now serves a prison term for her crime, the worse-than-incompetent “professionals” who not only failed to prevent her from committing the murder, but may have actively fed the paranoid delusions that acted as her rationale for the deed, remain unapologetic and without censure. It is my contention that proper professional mental health intervention may well have prevented this woman from murdering her son. The fact that her filicidal delusions could be reinforced by mental health professionals should be cause for outrage and reform. Jacobson, J. W., Mulick, J. A., & Schwartz, A. A. (1995). A history of facilitated communication: Science, pseudoscience, and antiscience. American Psychologist, 50, 750-765. McNally, Richard J (2003). Recovering Memories of Trauma: A View From the Laboratory.Current Directions in Psychological Science, 12, 32-35. Piper A, Merskey H. The persistence of folly: a critical examination of dissociative identity disorder. Part I. The excesses of an improbable concept. Can J Psychiatry. 2004;49(9):592-600. Piper A, Merskey H. The persistence of folly: critical examination of dissociative identity disorder. Part II. The defense and decline of multiple personality or dissociative identity disorder. Can J Psychiatry. 2004;49(10):678-683. Gharaibeh N: Dissociative identity disorder: time to remove it from DSM-V? Curr Psychiatry 2009;31:30–36. McNally, R.J., Lasko, N.B., Clancy, S.A., Macklin, M.L., Pitman, R.K., and Orr, S.P. 2004.Psychophysiological responding during script-driven imagery in people reporting abduction by space aliens. Psychol. Sci. 15:493 -497.